One of the most powerful satellites ever built has been put in orbit by a Russian Proton rocket. 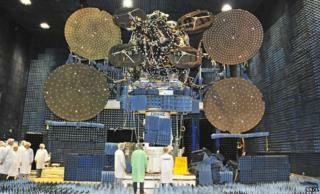 The Viasat-1 spacecraft will deliver broadband services to customers in the US and Canada. With a total data throughput of some 140 Gbps, the satellite has more capacity than all other commercial communications satellites over North America combined. Viasat-1 left Earth from the Baikonur Cosmodrome in Kazakhstan. The lift-off for its carrier Proton rocket occurred at 00:48 local time (18:48 GMT Wednesday). The flight was declared a success just over nine hours later. Viasat-1 will be moved to a geosynchronous position at 115 degrees West, and should become fully operational in 2012 after a period of testing. The satellite carries the name of San Diego-based space technology supplier Viasat, but will be pressed into service for its satellite broadband division, Wildblue Communications. Wildblue already has more than 400,000 subscribers using a trio of satellites, and should have room for about a million more with Viasat-1. "Consumer demand doubles about every two-and-a-half to three years. In other words, you want twice the service, twice the speed, twice the volume that you had two or three years ago for the same price," explains Wildblue president and CEO, Tom Moore. "Viasat-1 is all about trying to address that growing, insatiable demand," he told BBC News. The company expects to be offering a range of consumer packages, directly or indirectly through partners, typically in the download range of 8-12Mbps and at a price of around $50 a month. Viasat-1 is among a wave of new satellites that are operating in the Ka-band, a part of the satellite-apportioned radio spectrum that allows high data-rates. Media captionWildblue's Tom Moore: "Satisfying growing, insatiable demand"
Prior to Viasat-1, the most powerful commercial telecoms satellite in orbit was Eutelsat's Ka-Sat with a total throughput of some 70 Gbps. Online since May, it is serving European consumer broadband markets. Wildblue's principal competitor in North America, Hughes Network Systems, has its own Ka giant coming next year. The satellite, called Jupiter, will have a total throughput of 100 Gbps. Many more satellite operators are expected to enter the fray in the coming years. All of them believe their next-generation spacecraft will help transform the image of satellite broadband. The platforms' in-orbit technologies are now capable of offering ADSL-like speeds at more competitive prices. Allied to this, improvements have been made to their gateways, or ground segments, to tackle old bugbears such as latency - the time delay associated with data having to travel 36,000km up to space and back before crossing computer networks. The operators claim that for nearly all applications - bar fast-response, or "high-twitch", online gaming - latency is no longer the issue it was. The need for a dish installation and then a relatively expensive subscription mean satellite broadband was typically seen as a last-resort solution for "not-spots" - locations where no terrestrial broadband technologies are available. These are mostly remote rural areas, but include a surprisingly large number of places close to major conurbations. However, Wildblue says the capability of Viasat-1 also allows it to spread its appeal to those locations that simply have a poor broadband experience. "We've tended to focus on areas where there's not a huge amount of other alternatives, but increasingly we think that we'll be very, very compelling to what we consider the 'under-served' - not the unserved, the people that have no alternative, but the under-served markets. These are people who would pay maybe a little bit more for a higher speed and/or a higher quality of service," said Mr Moore. The US experience is being watched closely in Europe where the first net-dedicated satellites became operational this year. As well as Eutelsat's Ka-Sat, London-based Avanti Communications began putting customers through its new Hylas-1 platform. There is still some scepticism concerning Ka; there are investors who worry that the satellite broadband market maybe squeezed in due course as fast terrestrial technologies - cable, fibre, 4G-LTE, etc - are rolled out to more of those unserved and under-served locations. "Viasat-1 is very important I think because it will prove that the demand in the US satellite broadband market is strong. And that should have good positive implications for the European counterparts, Eutelsat and Avanti," said satellite investment analyst Henrik Nyblom from Nomura in London. Eutelsat, for one, is very bullish, about the prospects for its Ka-Sat. CEO Michel de Rosen told BBC News: "Maybe one reason for the scepticism is that for more conventional satellites in what is our number one business [satellite TV], the ramp up is usually very rapid. "In fact, we sign contracts with customers very often just after launch, and sometimes for up to 15 years - the life of the satellite. "In this case, because it is new we expect the ramp up to be more progressive. That is a change compared to what the people who follow us and who know the industry are used to." And he added: "We will see more high-throughput satellites because they are the best way to reduce the cost of supply. And because demand is there, expect to see more of them in Europe and on other continents." Additional to their consumer broadband markets, Ka satellites are likely to find increasing use in specialist video applications, such as for news organisations needing to report live from the field, and in providing connectivity to passengers on planes and trains. Wildblue has done a deal to provide such connectivity on the American airline Jetblue, and has been talking with United Airlines and Continental about the prospects for similar services.